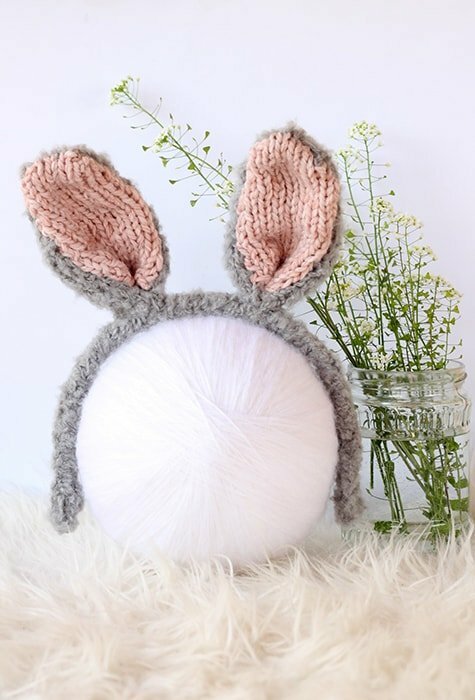 Make a fluffy knitted bunny ears headband with this free knitting pattern and tutorial. 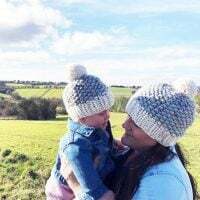 The knitted pieces are knit flat, then seamed and assembled to make up the headband. You can use any size headband – for a child or adult. I started off by buying a set of three pretty velvet headbands that cost about $1, they had bows on, so I ripped them off first. 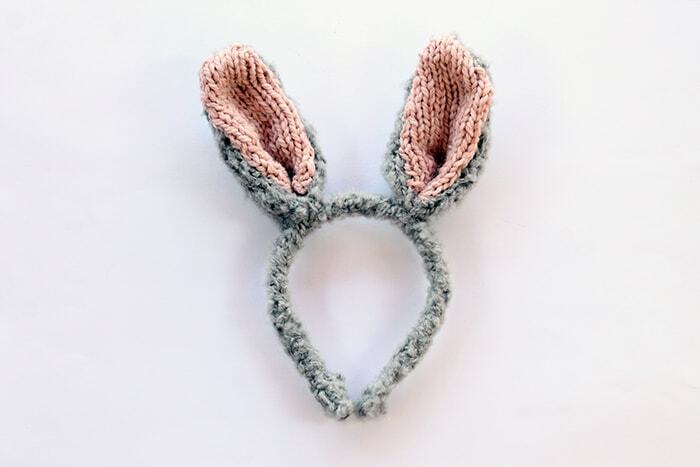 They were great colours, white, pink and grey, perfect for bunny ears, but it didn’t matter too much because I was going to cover the headband with yarn to match the ears. 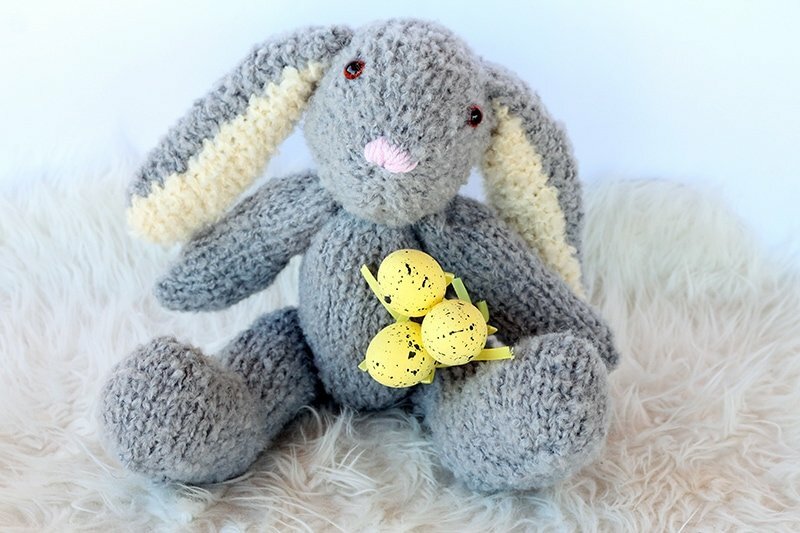 I ended up making two headbands, one in grey to match the Easter bunny I had made and the other in a softer white fluffy yarn. The bunny ears that I made from the La Mia grey mohair boucle yarn turned out a bit stiffer and much better at standing up on their own. The white fluffy ears were much floppier, so I used some soft jewellery making wire to thread through so that they could hold their shape. This meant that they could also be bent and manipulated into different positions. 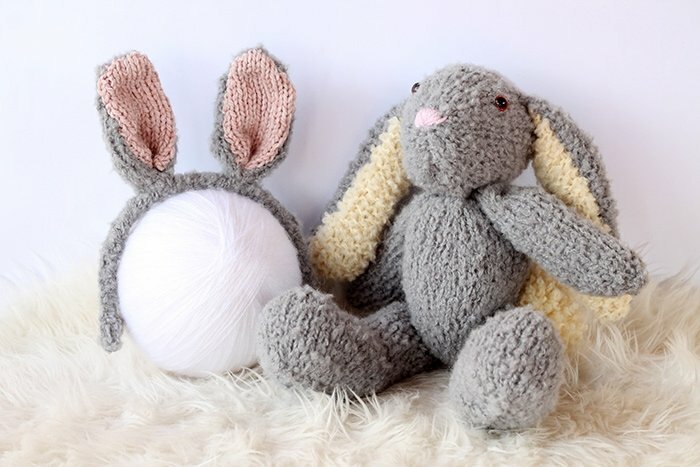 Originally I just wanted to make the grey bunny headband, as this was going to match the bunny I made from the same yarn. 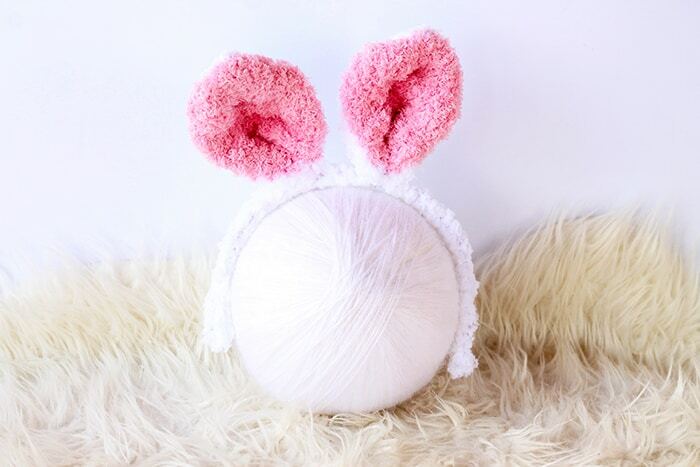 I didn’t have enough of the cream mohair boucle yarn left over to use for the inside part of the ears – to match the floppy bunny ears on the toy, so I ended up using pink instead. They worked up well and can easily stand without flopping over or down. 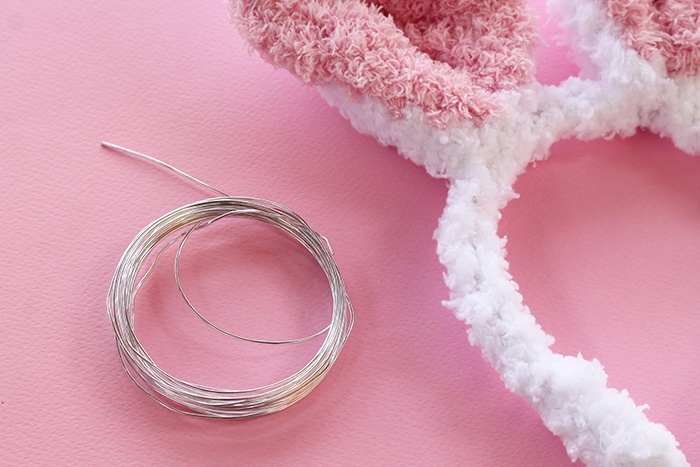 This rabbit headband I made from some left overs of a soft yarn from Sirdar Snuggly in white and pink. I had used some of this to make an Easter bunny egg cozy and that worked really well. But once the ears were enlarged, they became really floppy and had a little trouble staying upright, when wearing the headband. After I had added the wire – they were much better and could stand and be positioned. If you do add wire into your ears to make them stand how you want them too, just make sure that you hide the wires safely and that they are not poking out anywhere. So depending on how you position those ears, I guess they could be more for the adults to wear as part of a bunny costume! 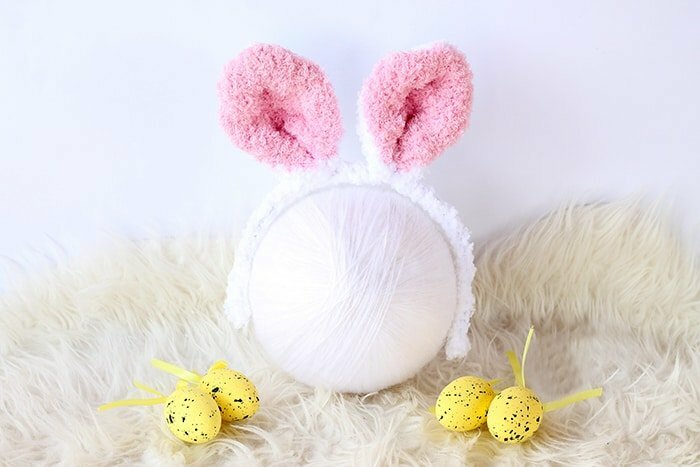 The headbands are pretty easy to knit and put together, so if you need a last minute Easter bunny costume, then this will have you sorted! 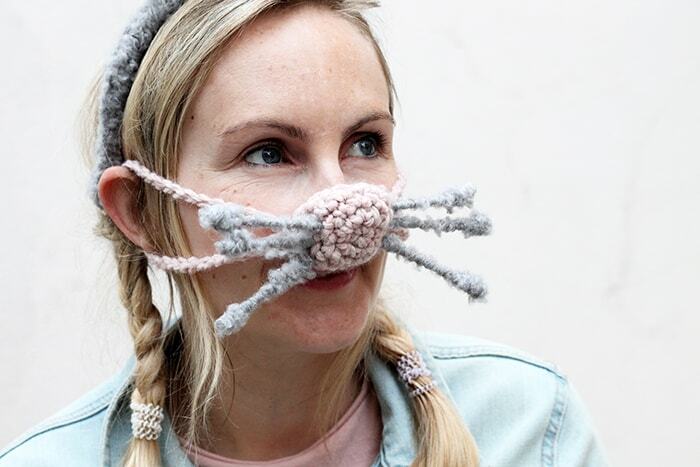 You can also make a nose glove to wear that matches the headband. 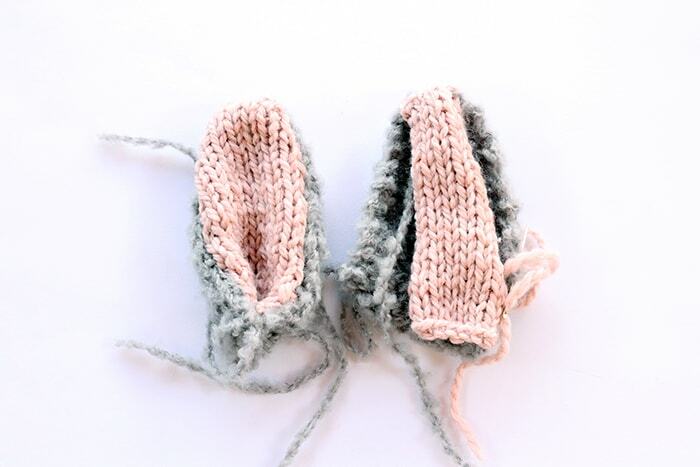 The nose mitten is crocheted from the same yarn as the inner ears in pink, with ties to hook around your ears. 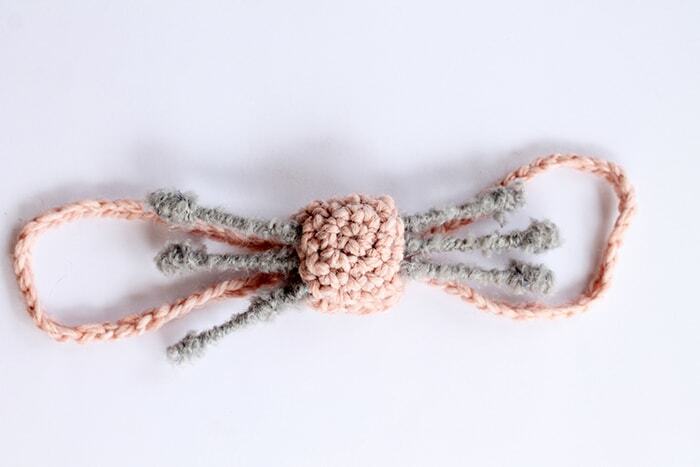 It’s really simple to make, even if you don’t have much crochet knowledge. With or without the whiskers it could add some silliness to your day! 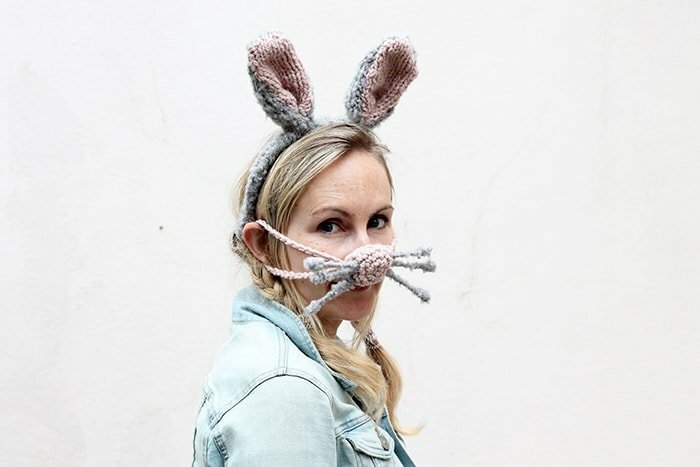 The bunny whiskers that I added were hastily done because I really wanted to use pipe cleaners, which would have worked better. But I didn’t have any, so improvised by using q-tips from the bathroom cupboard, my glue gun and the grey fluffy yarn I had left from making the headband. I put a tiny amount of glue at one end, wrapped the yarn around and left a little of the q-tip showing before glueing the yarn into place. 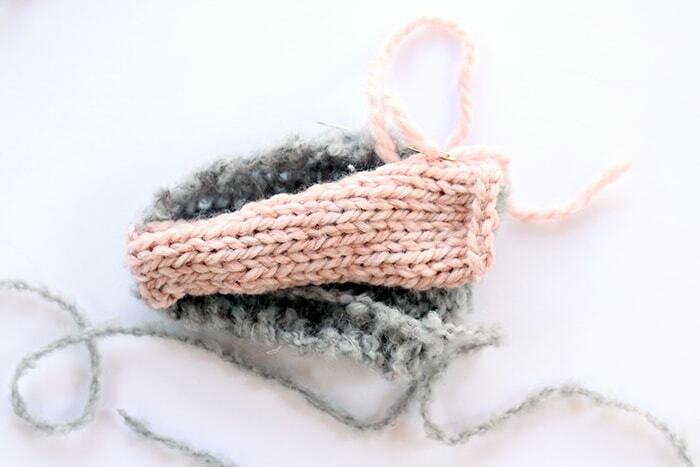 The end of the q-tip can be poked through a hole in the crochet nose warmer and it stays in place. Pipe cleaners would be better, as they can be hooked inside and fixed, so they don’t move or fall out. Take a look through the tutorial below and come back to leave a review if you enjoy it! 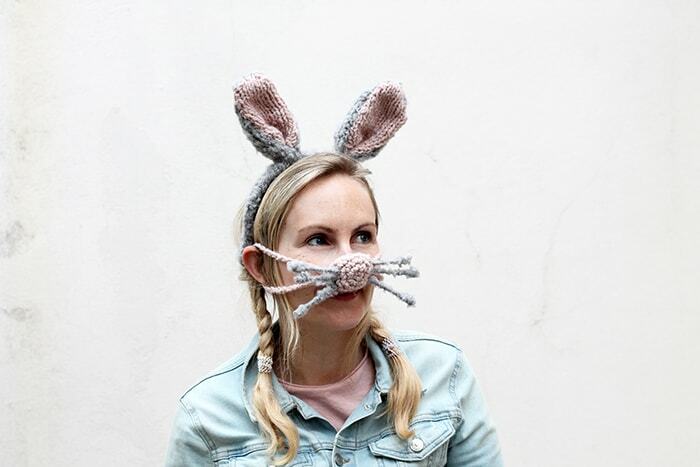 Wear bunny ears and a matching nose warmer by making your own this Easter! 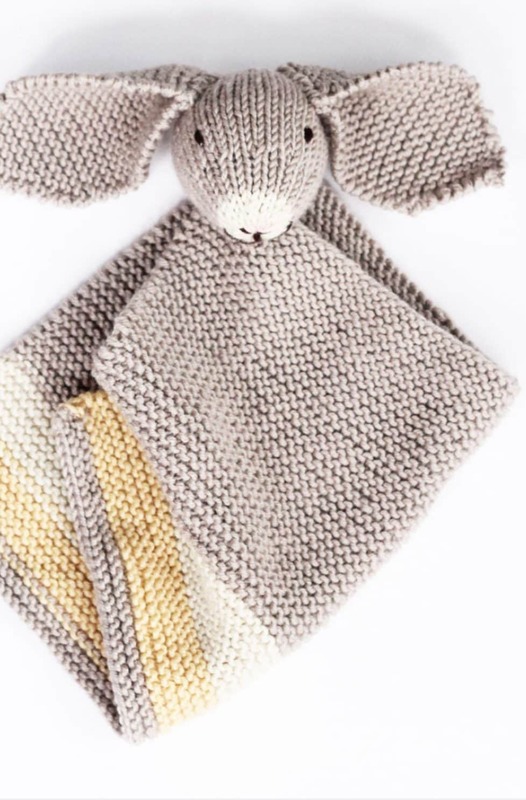 You could also use any scraps of yarn you have left over in your yarn stash for this project. For the white/pink ears I used Sirdar Snuggly Snowflake Chunky in white and pink. 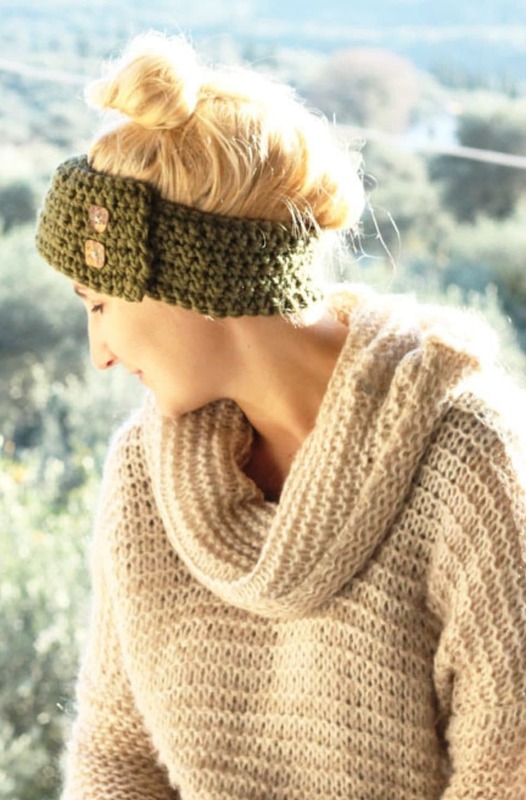 Stitch the length of the knitted piece around your headband seaming in the same yarn. Change to Yarn B and work 23 rows in st,st (starting with a P row), inc by KFB at each end of rows 2, 4 and 8. 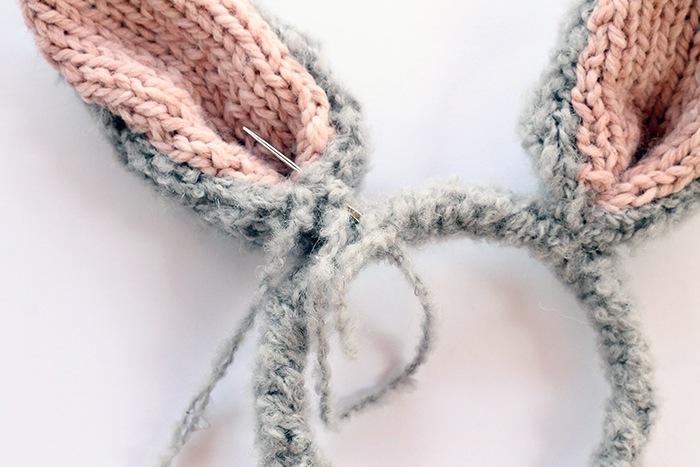 Using an invisible seam, stitch the side seams of the ears. Then stitch the bottom part of the ears together, so that they have the ear shape. 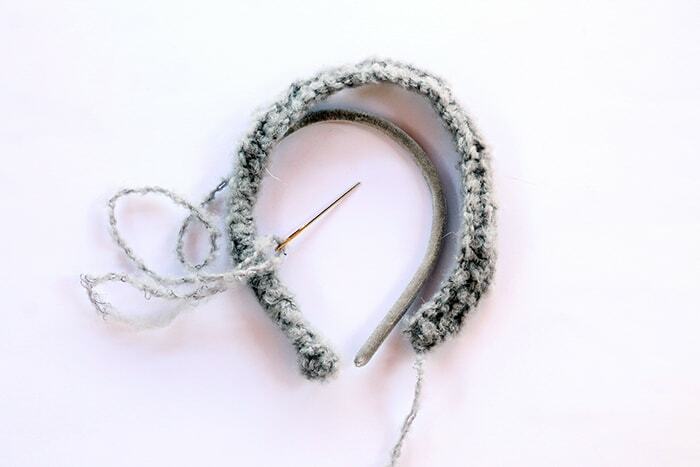 When both ears are ready, stitch them into place on top of the headband. This may be a little fiddly to do, but keep going and when they are secure, weave in any loose ends. Once you have finished, the headband will be ready to wear! Ch 2, 6 SC in 2nd ch from hook (PM). *SC in the next 5 sts, 2 SC in next st*, rep from * to * twice. SC in the next 2 sts, * 2 SC in next st, SC in next 2 sts*, rep from * to * until the end of the round. *SC in next st, SC2tog* Rep from * to * until the end of the round. Pull the yarn in the middle of the inner ring tight to close the hole. Make 2 chain lengths - In Yarn B - Chain 35 and secure. Stitch both ends to one side of the nose and then again with the second chain tie to the other side of the nose. Secure and weave in all loose ends. 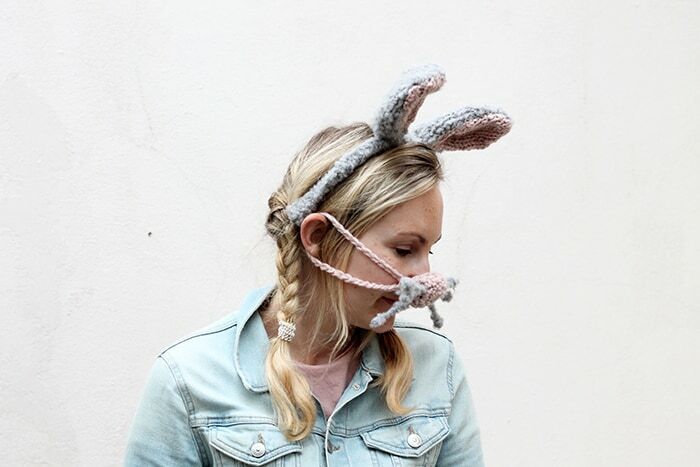 To make the bunny whiskers easily, you can use pipe cleaners and cut to the length that you want, hooking them into place and securing to the nose. 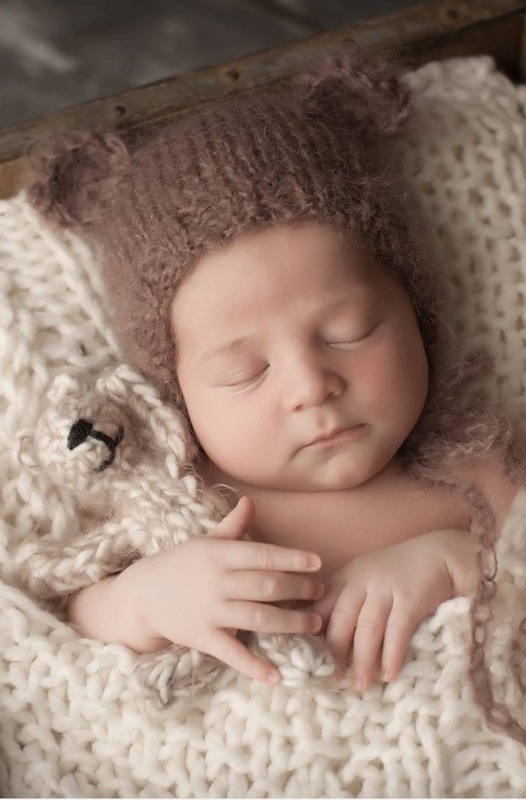 Or - you can use 6 q-tips, your glue gun and the fluffy yarn in the MC used for the headband. 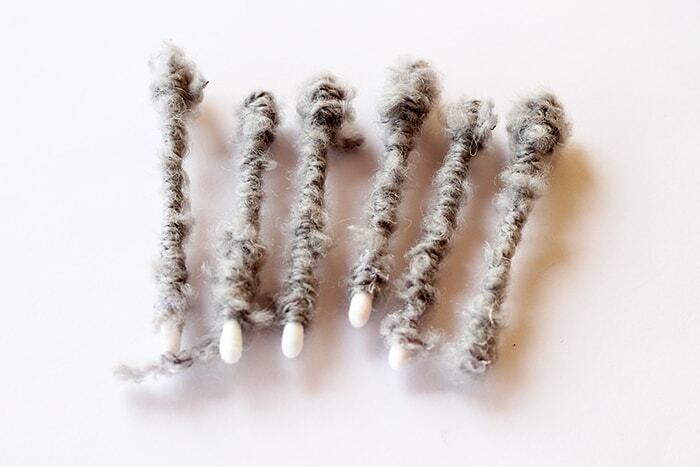 Put a little glue on one end of the q-tip, wrap the yarn around and then leave a little of the other end of the q-tip showing. 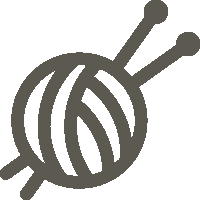 Place another little bit of glue and secure the end of the yarn into place. The end of the q-tip that has no yarn - push it through a hole in the nose. Do that for all of the other q-tips. 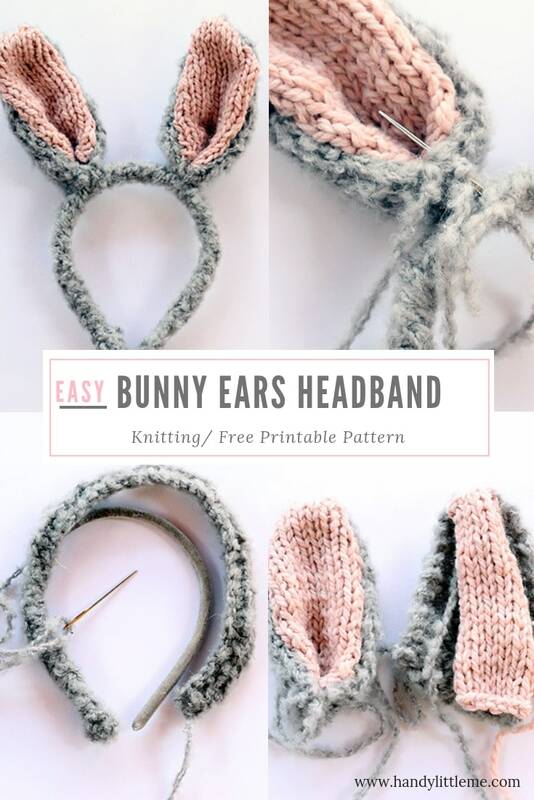 This fluffy bunny ears headband knits up quickly in boucle yarn, and the simple design makes for a relaxing and enjoyable knit. Depending on your headband size - Kids to adults. 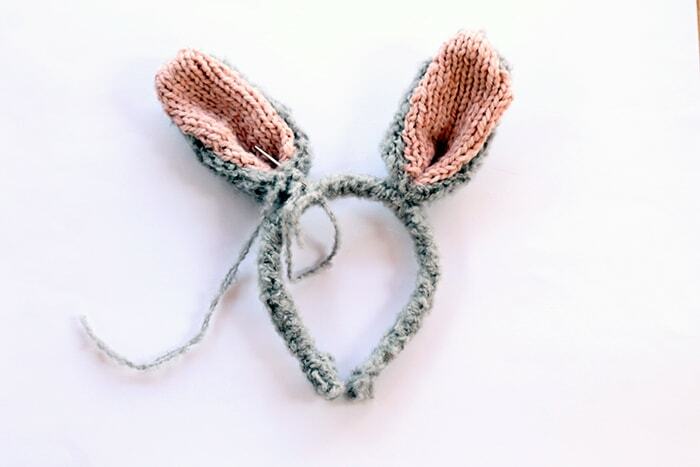 The ears on the headband measure - 5 inches tall and 3 inches wide.